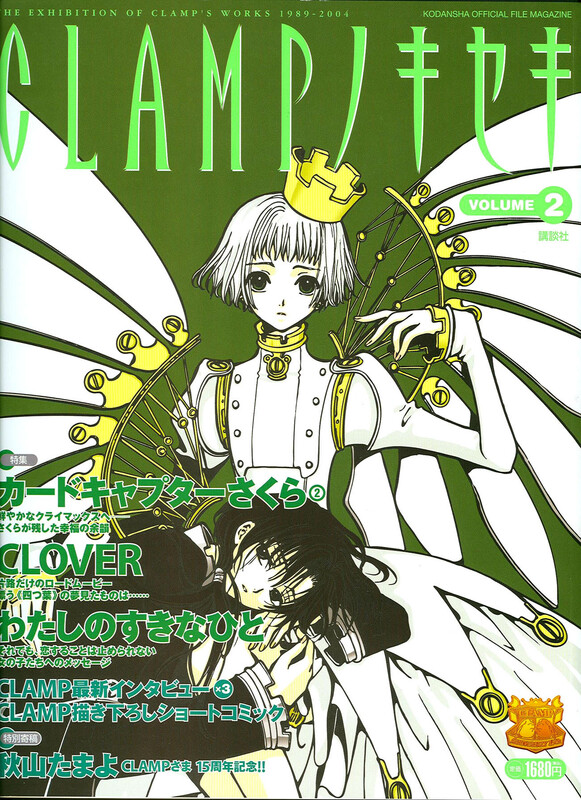 Please tell us how CLOVER came to be serialized. Ohkawa: When Kodansha created their new magazine for young girls, we were invited to create a series for it. When we heard that the intended audience was older than the magazine we were serializing Card Captor Sakura in, Nakayoshi, it sounded perfect. There was a time when I came up with several different stories for the same set of characters, and CLOVER was one of those. In that story, someone took a girl from a facility and they ran away together; the contents of the two versions were similar, but in the original the fugitive element was a bit stronger, with more suspense and action. I could have left it that way, but since it was a brand-new magazine for girls, I decided to make it prettier, and made the modifications. You were running X and Wish at the time. Wasn’t it difficult? Ohkawa: We weren’t troubled by that. However, it was a great problem coming up with lyrics– that, and laying out exposition. There may be parts of the story that are hard to understand. You say that you had come up with the story’s format previous to serialization; are the characters the same as when you first conceived them? Ohkawa: No, I modified them after it the serialization was confirmed. At first Suu was more of an innocent character, but she became a silent, quiet girl. As for her design, partly because I don’t like long hair, I had her hair be short. I wanted her to be a flashy child who could be seen as either a boy or a girl. Mokona: We had to redesign the hair so many times. There’s not that many variations for short hair. *laughs* At least her hair color was decided from the beginning. Nekoi: We even drew up a version with very short hair. Ohkawa: Very-short hair isn’t cute in manga. After a period of trial and error, we eventually reached a good design. How was it from the illustrator’s point of view? Mokona: We worried over Suu’s design, but once that was decided we didn’t have many other road-blocks. We quickly came up with the male designs. Then we had to set the background design. For the buildings we referenced old movies to make it resemble Germany and other European countries. Ohkawa: We wanted to give a feeling of decadence– let’s call it a feeling of nostalgia and reminiscence. We also made the wing designs to be like older mecha. I was fairly influenced by the movie “1984”. I had Mokona watch that movie and recapture its mood. Mokona: We also used older European photographs as references, like from photo albums of German factories. CLOVER has a distinctive sense of layout, in terms of design. Ohkawa: That was the hardest, and most fun, part of this series. *laughs* We designed the layouts keeping music videos and movies in mind. The story-paneling was planned out, of course, by Mokona, but I had a hand in about half of it. The script was unusual, what with the lyrics, so Mokona couldn’t plan it out by herself. One time I had Mokona, after I gave her the script, plan out a rough draft of the story-panel layout– and from there I took over. Igarashi: Once the storyboard was finished, we had to plan out the width of each panel, which wasn’t easy either. *laughs* It took way more time than usual. Ohkawa: We didn’t plan things like “for flashback scenes, use thinner frames” for CLOVER. The priority was with the design, so we ended up using thinner frames because it looks pretty. You mentioned that you had partitioned CLOVER into four stories; do you have any plans to continue the series? Ohkawa: If we had the opportunity, we’d definitely continue it. However, the magazine it ran in no longer exists, so any plans for a continuation in undecided. I’d like to someday have the chance to finish the story. “Cartridge paper” In Japanese Mokona says “gayoushi,” which my dictionary translations as: cartridge paper, construction paper, and drawing paper. …Gee, thanks. I chose cartridge paper because that sounded the most likely. Interview originally published in CLAMP No Kiseki vol. 2 (Kodansha), released on October 22, 2004.